As Villa fans we all know the well-worn phrase of ‘proud history’…in fact in the lean times of late, our rivals can’t help but point out we’re stuck in it. But hey, what is the point of a trophy cabinet if not to store history in? With the opening in Manchester of the largest football museum in the world, a couple of years ago, it’s nice to know that the city that hosts the top two teams of last season has a little reminder of Villa’s heritage. If you’re off to Old Trafford or the Etihad to watch Villa, it would be rude not to pop in between pints to pay one’s respect. After all, it’s free to get in and slap bang in the centre of town. MOMS had a good chat with Adam who works at the Museum to get an insight into what it offers Villa fans in particular. 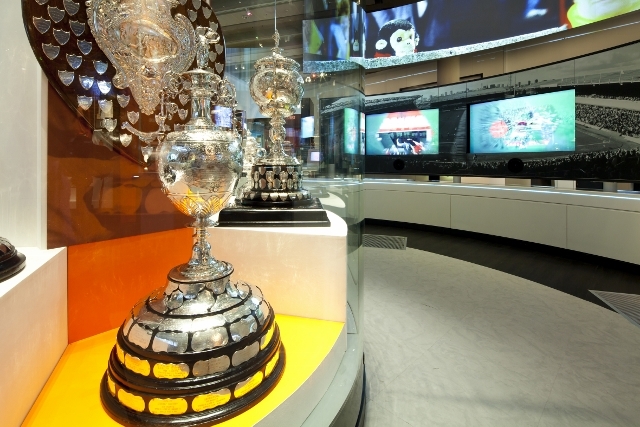 When you arrive at the museum, one of the first things that will greet you is the team that was most recently inducted into the Hall of Fame, Aston Villa’s 1982 European Cup winning team. A deserved place, after all, that team of underdogs achieved one of the greatest English victories of the famous cup. There’s also a framed program of the final on show (which reminds me, I still need to get a frame for mine). 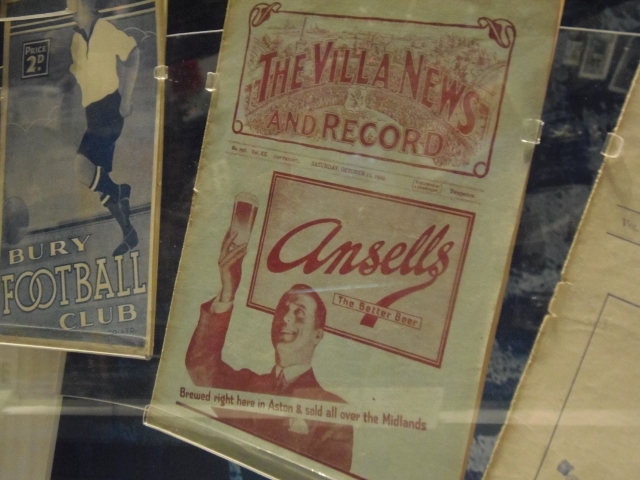 There’s also the trophies from a time way before Villa’s European Champions, from back in the day of the turn of the 20th century when Aston Villa won trophies for fun. 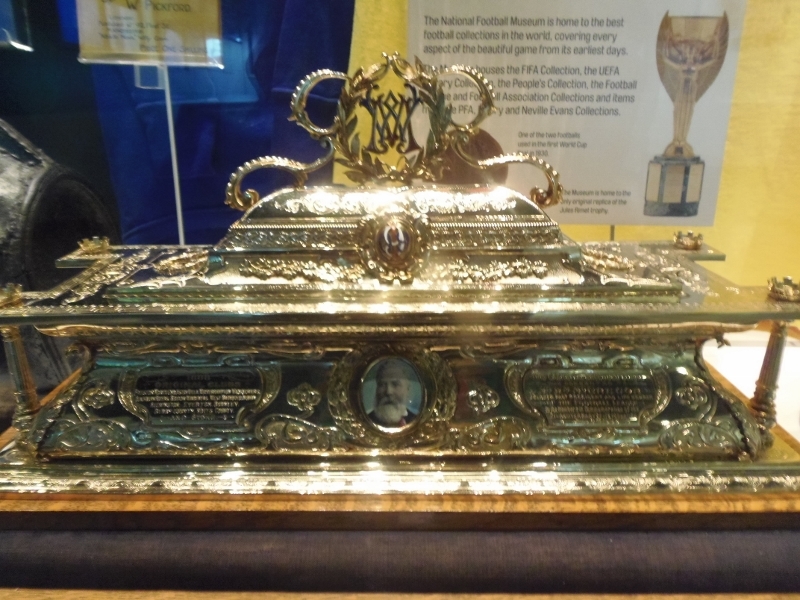 Perhaps the most intriguing and idiosyncratic Villa item on display at the museum is the silver casket presented by the Football League in 1909 to Villa’s founder of the league William McGregor. It contains a commemorative scroll that was given to the chairmen of each of the league founding clubs to mark the league’s 21st anniversary. Due the importance of his Godfather-like role in creating the league, only McGregor got the silver casket treatment. By the looks of it below, it’s the kind of thing that wouldn’t look out-of-place in an Indiana Jones’ movie. 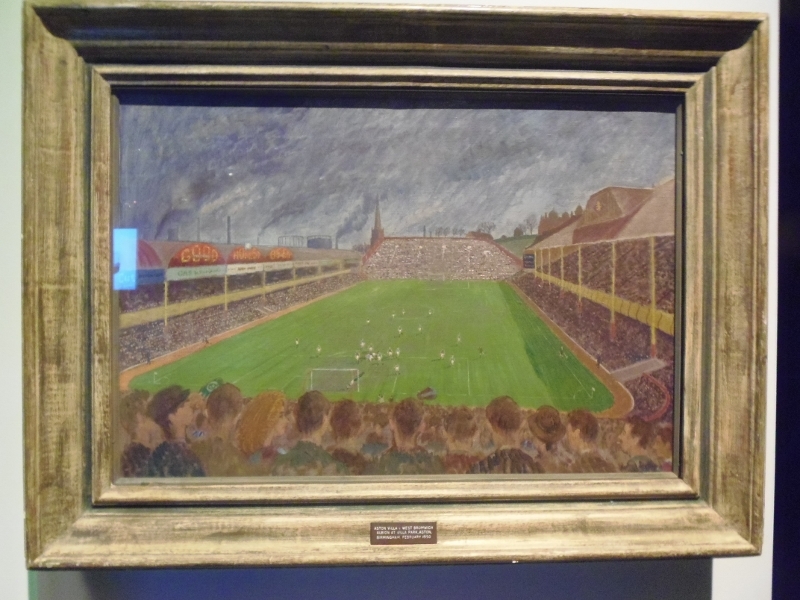 Another item out of the ordinary is a 1950 oil painting by Henry Daykin depicting a match at Villa Park. The teams involved? The clue’s in the painting’s title – ‘Aston Villa v West Bromwich Albion’. It’s not often you see many football matches immortalised in oil. Did Daykin set his eisel up in the Holte End or North Stand? You decide. I didn’t dare ask how much Manchester United paraphernalia (junk) they’ve got in the museum, although I was told they do have Manchester City legend Colin Bell’s cardboard crown that was presented to him at Maine Road by fans who had scaled the fence to greet King Colin at the time. The fact that Bell had kept the paper crown along with his medals shows the bond that once existed between players and supporters, before money drove a wedge between them.